Opening Sentences: Only in my dreams had I ever imagined I might come to Venice. And, given the nature of dreams, I had always pictgured the city sunny and warm, with gentle, salt-tinged breezes and melting colors and a handsome gondolier to row me about and serenade me as he declared his undying love. Synopsis: A crumbling palazzo in nineteenth-century Venice holds a buried secret. After she nearly ruins her family with a terrible misstep, Elena Spira is sent to Venice to escape disgrace and to atone by caring for the ailing Samuel Farber. But the crumbling and decaying Ca’ Basilio palazzo, where Samuel is ensconced, holds tragic secrets, and little does Elena know how profoundly they will impact her. Soon she begins to sense that she is being watched bysomething. And when Samuel begins to have hallucinations that make him violent and unpredictable, she can’t deny she’s in mortal danger. 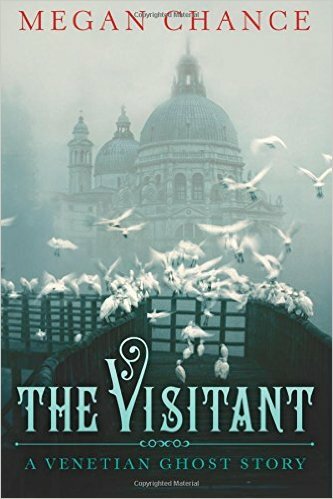 The Visitant by Megan Chance is a delightful gothic tale set in Venice. Elena Spira travels from the U.S. to Basilio Palazzo to work as a private nurse for an epileptic man named Samuel Ferber. The mood is set with the crumbling palazzo and its location in a less than desirable, neglected area of Venice ripe with crime and plagued with filth. Further, an old aunt and a female servant and their suspicious, untoward behavior adds curiosity and tension to the story as it progresses. Once there, Elena encounters an impoverished nobleman named Nero Basilio (whose family owns the decrepit palazzo). Seizures, ghost sightings, addiction, family secrets, and loyalties are revealed throughout. The ending was definitely an unexpected surprise. This was a truly enjoyable cozy gothic mystery. Definitely satisfying!